I couldn't resist picking up this little gem from the HPB bargain bin, especially with a name like Texas Jim Robertson. And since I went on my dude ranch vacation last year, I just can't seem to get enough of cowboy songs! Listening to this record made me want to go back to the dude ranch (and I will - it was great!). And since this record has my very favorite song in the whole world, "You Are My Sunshine", well, I just had to buy it. (I think I now have 48 versions of that song.) My other two favorite songs on this record are "Slipping Around" and "Old Time Religion" - such fun! 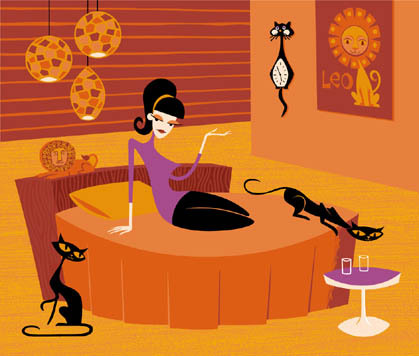 Remember those great K-tel commercials on TV? And how many of you bought K-tel records? I know I have several in my collection! I loved the K-tel records because they were mostly compilations of "20 great hits from 20 great original singers"! Many times, I just liked the hit song that played on the radio, and I didn't want to buy the whole album of a particular musician for that one song, so K-tel records were just perfect compilations for me! Well, this particular record is not one that I bought back in the day, but I couldn't resist it when I saw it at an estate sale. I do love a good polka! And how could I pass up a record with the polka king, Frankie Yankovic, AND Myron Floren from "The Lawrence Welk Show", AND the Six Fat Dutchmen?! 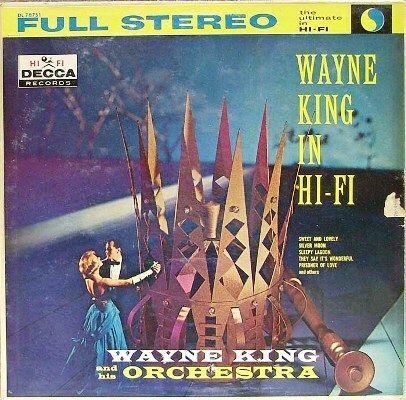 Apparently though, there seem to have been several versions of this record - I found three different ones on the internet, all from K-tel with the same name and same number (NC 420). Side 1 seems to be the same on all three versions that I found, but side 2 varies. Maybe they released different versions in different countries or markets? 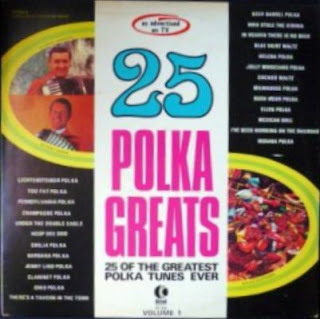 Anyway, it's a fun album and sure to get you up on your feet and polka-ing around the house! 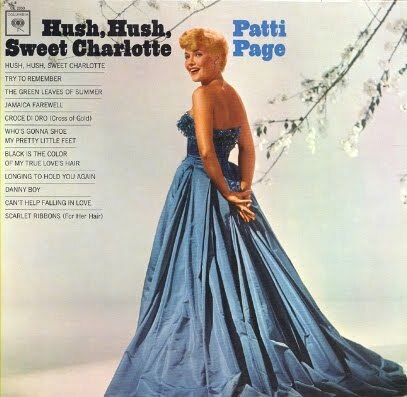 Here's the Singing Rage, Miss Patti Page singing the title song from the movie "Hush, Hush, Sweet Charlotte". (If you've never seen the movie, try to catch it on TCM sometime or rent it - it's great!). In addition to that song, Patti sings some old favorites such as "Scarlet Ribbons" and "Danny Boy". I have yet to find a Patti Page record that I didn't like - they're all great! As a little girl, one of my favorite songs was "Doggie in the Window" (which was also the first song I heard on my favorite local AM radio station, KAAM), and when I was doing the ballroom dance thing, I danced many a waltz to her songs. I also had the privilege of seeing her perform here in Dallas back in the mid or late 1980s, and I particularly remember her singing HHSC. How many of you grew up watching Jim Nabors as Gomer Pyle, first as the gas station attendant on "The Andy Griffith Show" and later as the goofy marine private on "Gomer Pyle U.S.M.C."? I absolutely loved Gomer and never missed the show. And remember the first time you heard that baritone singing voice come out of that goofy guy? What a surprise! 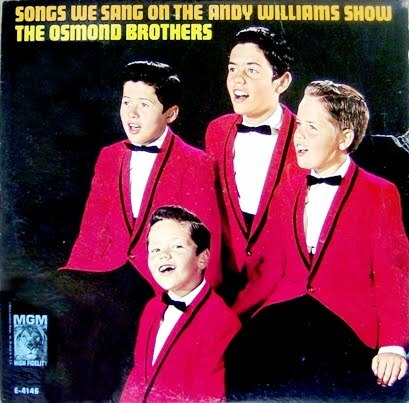 I used to love to try to imitate his singing (imagine a little girl doing that) and really got a kick out of it. 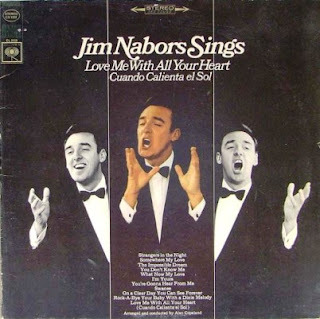 (Come to think of it, I still try to sing "O Holy Night" in my best Jim Nabors voice.) My mom thought he was a wonderful singer and loved his version of "O Holy Night", so she did not appreciate my attempts to sing it the way he did ("Stop singing! You're ruining the song!"). Anyway, I still get a kick of listening to old Jim Nabors records, and he sings a lot of very familiar songs on this album. This is his second album (he recorded his first album in character as Gomer Pyle). 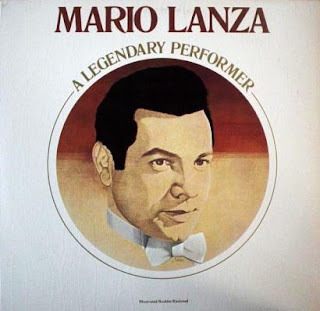 Here's one in a category that I don't usually post - a record of Mario Lanza songs. I got this record during one of the several times that I was in one of those mail-order record clubs. I had seen a movie starring Mario (where he sings "Arrivederci, Roma") and just fell in love with him. To this day, that song brings tears to my eyes because he sings it so beautifully. I know my mom was pleased that I liked this kind of music - thought I was growing out of that "rock and roll" stuff! Mario Lanza, tenor. He was around for too few years. Legendary performer. Legendary personality. He stamped his image on his times and left the sound of his voice for a world to enjoy. And now, get set for a wonderful treat in high fidelity... as Wayne King and his orchestra show you how to put the "mood" in mood music.